[German]Does Windows 10 ends with an error code 0x80190001 when installing a feature update (upgrade) and aborts the install process? In this blog post I will develop some hints to decode and repair this error. Error code 0x80190001 is mentioned within several forum posts. As an example, this MS Answers forum post contains a typical description. My first thought was, that 0x80190001 is a HRESULT error. But I could not find this error code within typical HRESULT error code lists. Then I stumbled upon my own forum post (in German MS Answer forum) from November 2017. Obviously at that time I’ve had a better search result. Within the forum post I gave the following explanation. Error stands for HTTP_E_STATUS_UNEXPECTED or a MREGISTER_E_DEVICE_MESSAGE_FORMAT_ERROR. The server reports an error, but the Windows Update Client cannot determine the cause. Error code 0x80190001 is a so called MDM registration error, documented within this Microsoft MSDN document. MDM stands for Mobile Device Management Registration. At a first glace, this information does not help us much at this point, except that there are problems in the communication between Microsoft’s update server and the Windows client and invalid data is delivered. However, this should be kept in mind, if we intend to identify a possible cause for this issue, as discussed below. At this point I would like to briefly discuss possible error causes for error code 0x80190001. 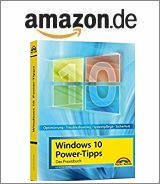 I’ve published a German blog post Windows 10 Upgrade-Troubleshooting FAQ – Teil 1 in November 2017, where I addressed this error briefly. Error 0x80190001: This error is often triggered by external tools (antivirus programs, etc.) (see this German forum post). Within this document, Microsoft suggests that you download the ISO installation file using Media Creation Tool and then install it from the installation medium. Deactivation is usually not enough when using a third-party antivirus tool. You should uninstall this solution and then run a so-called Clean Tool from the AV manufacturer. The technical background is that this process removes the so-called filter driver, which blocks the update installation when the virus scanner is only deactivated. To avoid a damaged Windows as a root cause, you may also run the check and repair steps discussed within my blog post Check and repair Windows system files and component store. An unexpected error was encountered while attempting to download files required for upgrade. To resolve this issue, download and run the media creation tool. See Download windows 10. So, if my suggestions given above doesn’t help, run the media creation tool to download an install image and create an install medium on USB stick or DVD. Then try to install Windows 10, either as an upgrade (execute setup.exe from within a running Windows) or as a clean install (by booting from the install image). Don’t try a direct upgrade of your system via the offered media creation tool option. The risk that this step terminating with the same error is simply too high. 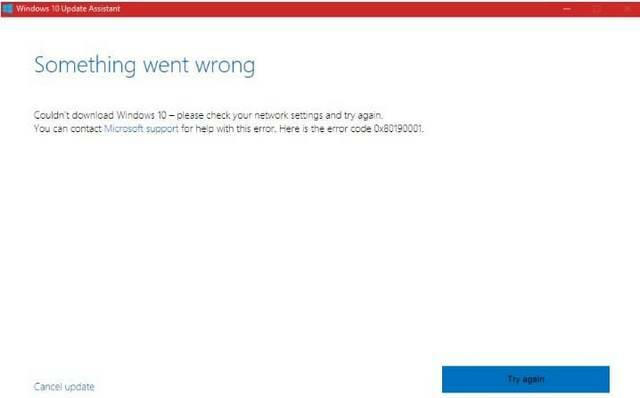 This entry was posted in issue, Update, Windows and tagged error 0x80190001, issue, Update, Windows 10. Bookmark the permalink. My laptop show error message however my laptop is connected with wifi. Then start a diagnose. Probably a third party antivirus software is involved.